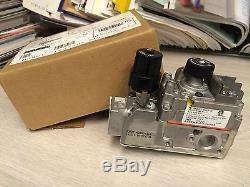 Replacement Robert Shaw variable natural gas (NG) valve for Quadra-Fire, Heat N Glo and Heatilator gas stoves. For standing pilot ONLY, does not fit IPI or DSI units. Fits the following HHT Gas Fireplace models. QV32B - Pre serial # 0021080519. QV32B-A - Pre serial # 0021080519. QV36B - Pre serial # 0021080519. QV36B-A - Pre serial # 0021080519. Heat N Glo Gas Stoves. AT-ZC-B - Robert Shaw Valve after February 2001. Bay Insert-NS - May 1996 and newer. Bay-GDV-95 - May 1996 and newer. 6000DVTFL - Serial # 12614 and higher. 6000GDVFL & 6000GDVFL-NF - Post Date Code 296 - Adjustable. 6000XL - February 1995 and later. 8000DVTFL - Post date code 2/96. 8000GDVFL - Post date code 2/96. 8000TR-OAK - Pre serial # 0021116425. 8000TV-OAK - Pre serial # 0021116948. Everest - Pre serial # 5000. SL-32S - Pre serial # 2185. SL-350TRS-C - Pre serial # 0021080044. SL-550TR-D - Pre serial # 0021076206. 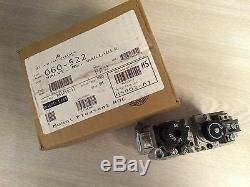 SL-550TV-D - Pre serial # 0021076055. SL-750TR-D - Pre serial # 0021076251. SL-750TV-D - Pre serial # 0021076242. SL-950TR-D - Pre serial # 0021076046. SL-950TV-D - Pre serial # 0021076046. DVT Stove - May 1996 and newer. Townsend II - Standing pilot, not SIT. We aren't happy until you know where your package is and when to expect it! Your satisfaction is important to us. The item "Hearth & Home NG Fireplace Valve 060-522 Robertshaw Standing Pilot Only" is in sale since Saturday, November 26, 2016. This item is in the category "Home & Garden\Home Improvement\Heating, Cooling & Air\Fireplaces & Stoves\Replacement Parts". The seller is "builderbuddies" and is located in Byron Center, Michigan.